I was reading Psalm 121 this morning and the word that came to mind was "secure". The same Lord who made heaven and earth watches over us. He is our help. He protects us. And he doesn't fall asleep on the job. He is ever-present in our lives. I think my favorite part of this verse, though, is that he won't let our foot slip. Friends, I am one of the least graceful people you know! And sometimes that tendency to stumble pushes into my spiritual life. I trip over my emotions. I fumble over what others say. I wobble with insecure thoughts. BUT GOD promises here he won't let our foot slip. 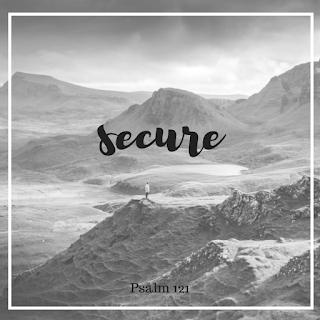 When we lean into his hold, he keeps us secure. Some days I just need to remember that truth!